Kit to treat Algae inside your BiOrb. One unsightly problem that can plague any BiOrb tank- is Green water, also known as algae. But treatment of this algae is simple with the Oase BiOrb Anti-Algae Kit. 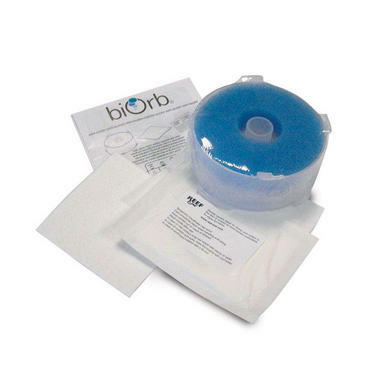 The kit contains a simple to use cartridge that can temporary replace the filter cartridge in your BiOrb in an attempt to treat the green water. When used with the supplied treatment sachets, the cartridge will work to remove the algae which causes the green water and restore the water to a clear and healthy environment. These cartridges are designed to be used as a temporary treatment and not as an replacement for the filter cartridge to attempt to prevent green water. The Anti Algae kit is designed as a temporary treatment and should not be used to replace the filter cartridge in your BiOrb.